Given the principles, policies, and behaviors we have observed from the Mormon Church and its members, it seems that being in the Church is often (but not always) regarded as more important than believing what the Church teaches. 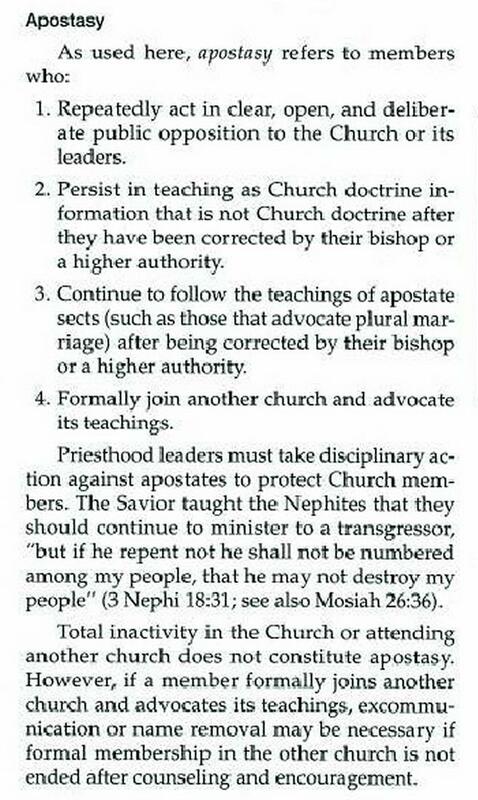 Book 1 of the 2010 Church Handbook of Instructions gives a definition of apostasy that includes many Church-centered aspects, none of which include mere unbelief in the gospel of Jesus Christ. If one publicly, explicitly opposes the Church or its leaders, they are apostate. If one formally joins another church, they are apostate. If one publicly teaches something as official church doctrine when it really isn’t (even after being corrected by a local leader), they are apostate. If one joins a polygamous Mormon sect or practices polygamy, they are apostate. Yet one is not normally treated as apostate if they fall into sustained, explicit unbelief over the fundamental teachings of Mormonism. One can reject the First Vision, the prophetic mantle of Joseph Smith, the resurrection of Jesus Christ, or the very existence of God, but they are not yet considered actionably apostate. Since Mormonism claims to be Christian, why doesn’t it require for its members to remain believers in (what is allegedly) the gospel of Jesus Christ? For one to say that Mormonism is entirely creedless would be misleading; there are beliefs that one must agree to in order to be baptized into the Mormon Church. But Mormonism does not have the same standard for retaining membership as it does for gaining membership. Once a person is baptized into the Mormon Church, they can become an ardent atheist somehow without becoming an apostate. In that sense, they are creedless. But this inconsistency and shallowness reflects a greater love for “the Church” than it does for what is allegedly the gospel of Jesus Christ. Part of what makes this membership issue more exacerbated is that the Mormon Church is a monolithic hierarchical institution that accomplishes much of its goals via top-down policies. It would not be hard to include a paragraph-long policy in the CHI mandating the terminated membership of anyone who can no longer affirm the beliefs required for initially joining the Church. The Bible gives plenty of precedent and direction for making provisional, albeit fallible, judgments, and to be responsible stewards over our families, churches, businesses, and any other dominion we have. And part of being responsible and “integritous” is having meaningful and not shallow views of religious membership. What spiritual benefit is there to staying a formal member of a church, the foundational truth-claims of which one rejects? How is it loving to encourage people to remain formally affiliated (or even actively involved) with a group they think is fundamentally based on fraudulent, ignorant, or misleading claims? How is it loving to encourage someone to be inconsistent with their personal life like that, to lack integrity? Why not instead encourage a person to live with integrity, and be consistent with their religious beliefs and religious affiliations?